Relations between the two seemed to have entered a particularly cold phase ever since Tej Pratap declared his separation from his wife, Aishwarya Roy, last November. Tejashwi Yadav and Tej Pratap met on Saturday. Tej Pratap said he gave his blessings to his brother for "victory"
Rashtriya Janata Dal (RJD) leader Tejashwi Yadav met his elder brother Tej Pratap Yadav and touched his feet as a mark of respect at his Patna residence on Saturday, days after media reports indicated a growing rift between the two. Relations between the two seemed to have entered a particularly cold phase ever since Tej Pratap declared his separation from his wife, Aishwarya Rai, last November and accused his family of siding with her. When the maverick politician made his first appearance in the Bihar assembly during the winter session, he avoided crossing paths with his younger brother. Weeks later, he indicated that he wouldn't mind taking over the RJD. Tejashwi Yadav is party chief Lalu Prasad Yadav's apparent choice of successor. 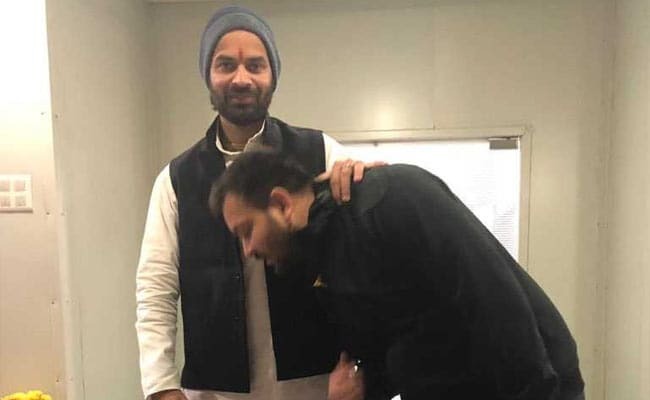 Tejashwi Yadav is seen touching elder brother Tej Pratap's feet in one of the photographs. Things came to a head on Thursday, when Tej Pratap announced that his sister - Misa Bharti - will contest the upcoming general elections from Pataliputra constituency in Patna. Tejashwi Yadav, apparently tired of having to put up with Tej Pratap's continued assertions before the media, finally let out a sharp retort. "If you decide everything on camera, what will the party's parliamentary board and Laluji do?" he asked. Tejashwi Yadav's statement was seen as a snub to Tej Pratap, who party leaders feel has become a huge source of embarrassment for the RJD with his out-of-turn statements. Things seemed to have calmed down by Saturday. 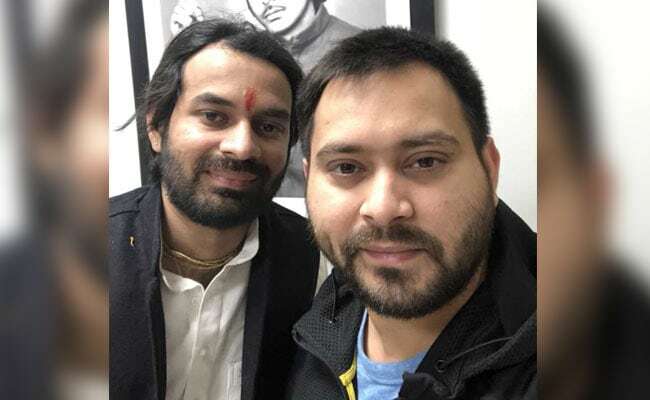 Tej Pratap posted three photographs of his meeting with Tejashwi Yadav on Twitter, sending across the message that the brothers remain united for the political battle ahead. "Meeting my Arjun before the upcoming elections and preparing the right strategies. I even gave him my blessings for victory in the battlefield. Preparations are on, and victory is necessary," the caption read. Known more for his public antics than politics, Tej Pratap Yadav has often referred to himself as Krishna and Tejashwi Yadav as Arjuna. He is expected to star in a Hindi film 'Rudra - The Avtar' soon.